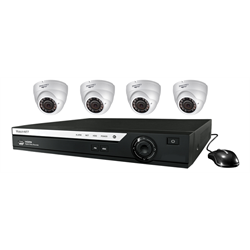 The ENM-04KIT4-30IRBF IP camera kit comes with a 1TB 4 channel DVR as well as 4 3-megapixel network dome cameras. The included MPIX-30IRBF-K28 cameras can be powered directly through the NVR using Power over Ethernet (PoE0 or using a 12VDC power adapter. They are IP66 rated, making them excellent for use outdoors. During the day, they’ll record in full-colour HD and upon detecting low lit conditions, they’ll automatically switch to night vision. Once it’s in this mode, it can detect objects up to 30 meters away in pitch back. The ENM-04POE DVR comes with an included 1TB hard drive and a dual-core embedded processor. 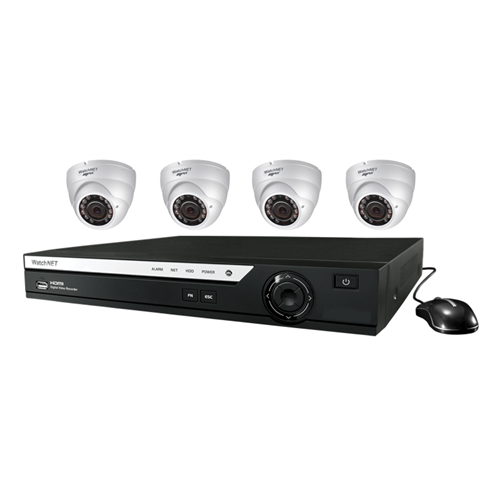 It can support up to 4 cameras at any given time. H.264 video compression gives the DVR extended storage time on the 1TB hard drive provided. It can optionally support up to a 6TB HDD. The free iOs and Android apps allow for easy remote viewing without any complicated network set up. Just scan a barcode and set up login credentials.